In DPW you set your shipping at the time you create or edit an auction or a DPW generated PayPal link for your art work. Your shipping configuration consists of how you are shipping, from where, to where, and for how much. You can either configure the shipping specifically for an individual work, or you can create and share a shipping profile among many works. Important: When you share a profile with more than one work, changing the profile will change the shipping for all the works that share it. There is a Save as Template button at the bottom of the create/edit auction and PayPal link windows on the Art Tracking Grid page. Clicking this button will save the current field values as defaults to be used the next time you create an auction or a PayPal link. This will not, however, save the shipping settings if they are for this art work only. 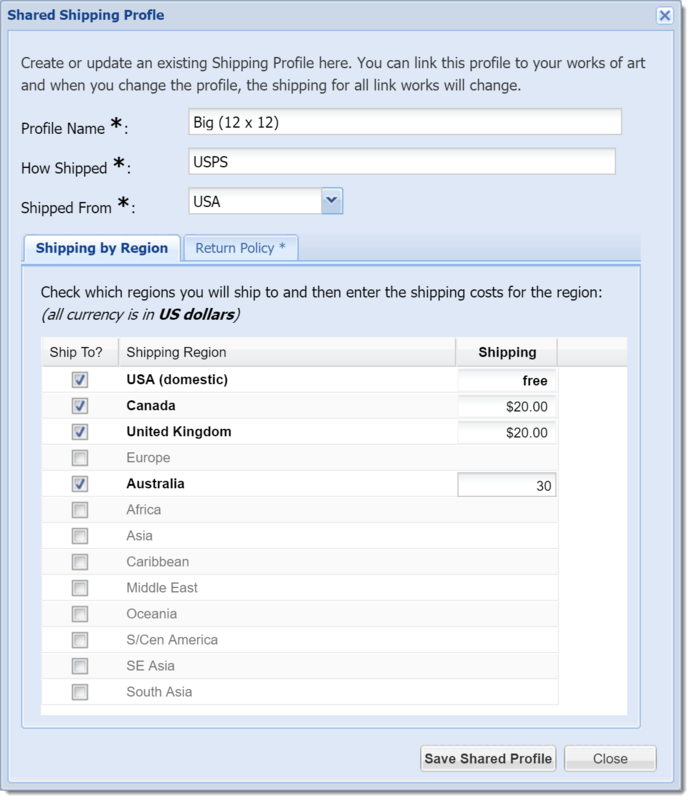 To save your shipping settings you must create a new or select an existing Shared Shipping Profile for your auction or PayPal link. Then, when you click the Save as a Template button, which will save the selected profile as the default for new auctions and PayPal links. Enter the name of the shipping carrier you use, such as USPS, USP, FedEx, DHL, etc. This is generally the region where you live. It defaults to the region you selected when you registered with DPW. You must enter a return policy. If you don't accept returns, just explain that you don't. These are the regions in the world you are willing to ship to and the shipping amount for each region. 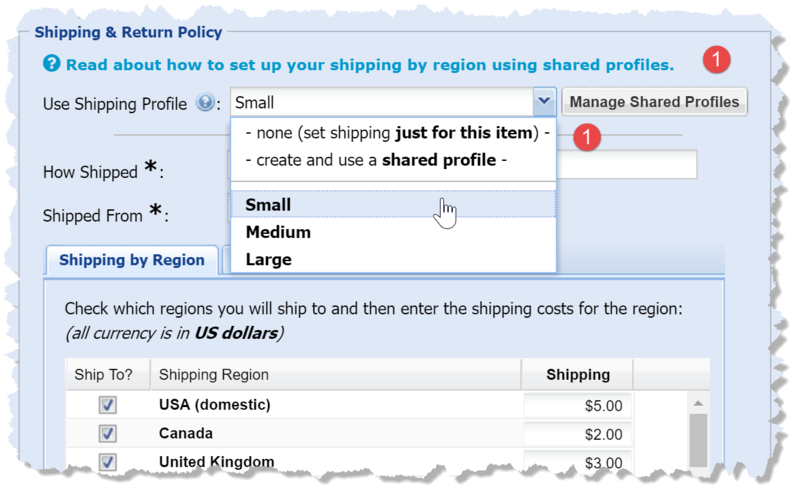 Select the regions you want to ship to in the list by clicking the check boxes in the Ship To? column. 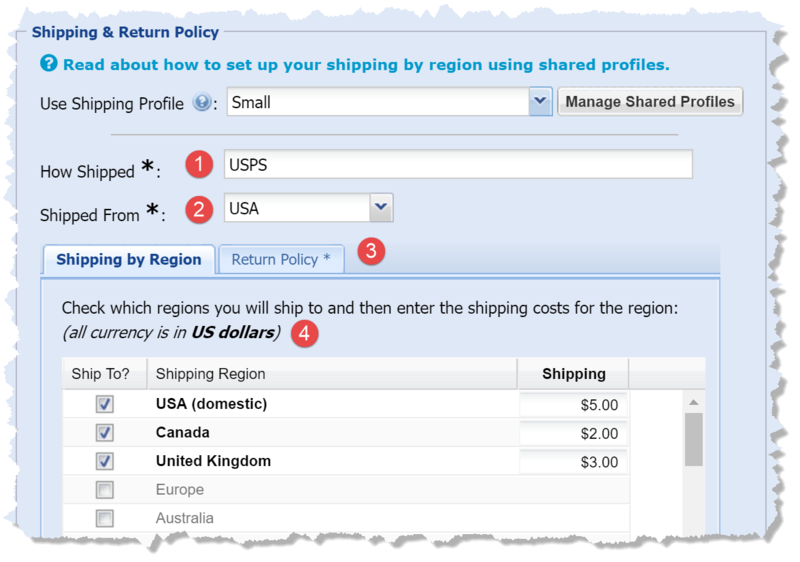 Then click in the Shipping column to enter the amount for the selected regions. When you specify the shipping for a work, you can either do so for that work alone, or you can select a shared shipping profile that you have previously created. If you set the shipping for just one work, then any changes you make only applies to that one work. If, on the other hand, you create and use a Shared Shipping Profile that you can share it with as many works as you want. For example, let's say you usually paint in three different sizes, each with its own shipping costs. 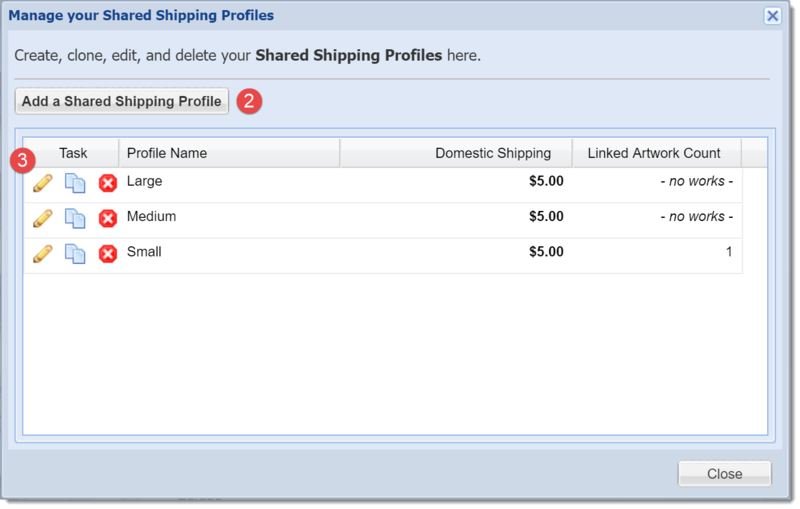 You can create three shared shipping profiles, named Small, Medium, and Large, set the shipping information and costs appropriately, and then easily assign the profile to a work when you create an auction or a PayPal link. This is done by selecting the shared profile in the Use Shipping Profile drop down list at the top of the shipping section in the auction and PayPal link forms. 1. Click the Manage Profiles button in either the auction or the PayPal form (see the above screen shot). A shortcut to creating a new shared profile and using it for the current work is to select the second item, create and use a shared profile, in the Use Shipping Profile drop down list. Important: At anytime after selecting a shared profile for a work, you can chose to set the shipping just for the current work by selecting the first item, none (set shipping just for this item). 2. Click the Add Shipping Profile button (see the following screen shot). 3. Or, click one of the task icons in the shipping profile list to edit, clone, or delete an existing profile. 4. Now, just fill out the Shipping Profile form to create or edit a shared shipping profile just as you would for the shipping section in the auction and PayPal link forms and you are done! 5. Done! Now you can share your new shipping profile with as many art works as you want! Posted - Mon, Apr 25, 2016 at 10:09 PM. This article has been viewed 6499 times.